The Highways Agency is advising drivers that traffic is likely to be busy around the M56 and M6 this weekend with up to 60,000 dance music lovers heading to the annual Creamfields festival in Cheshire. Creamfields 2014 features three days of events – running between 2pm on Friday (22 August) through to 11pm on Sunday (24 August) – and a record crowd is expected. Anyone thinking of driving to the annual bank holiday festival is advised to plan their journey and leave plenty of time to get to the festival site on Daresbury Estate near Runcorn, just off junction 11 of the M56. We will be doing all we can to manage traffic around the event and keep drivers on the move - festival goers and other drivers can help themselves by planning their journeys and keeping themselves up to date with traffic information. Previous festivals have passed off fairly successfully although we have had one or two issues with people from the site walking on the motorway network. We would like to remind everyone that the motorway is no place for pedestrians - it is dangerous and illegal and having pedestrians on the network can cause delays for legitimate motorway users. Car parks to the site will open at noon on the Friday and close at 2pm on bank holiday Monday 25 August. Traffic approaching on the M6 from the south will be directed via the M56 from junction 11. Traffic approaching on the M6 from the north will be directed via the M62 from junction 7. Traffic officers at the North West regional control centre at Newton-le-Willows, nerve centre of the regional Highways Agency traffic officer service, will use their electronic motorway signs across the local network to guide festival goers to the site and give information on any incidents or congestion. Meanwhile, other road users are being advised that the M56 around junctions 10, 11 and 12 around Runcorn is likely to be busy at key times of the weekend. 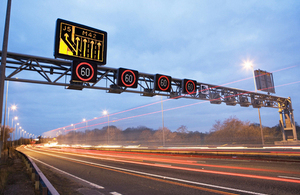 The M56 interchange with the M6 is also likely to experience higher volumes of traffic. Electronic signs along the M6, M56 and M62 are being used to give advance warning about the event. The Highways Agency is advising motorway users to check the latest travel information before setting out as well as listening for radio traffic alerts and heeding electronic signs once they are on the move. The North West traffic officer service has been working closely with Cheshire Police and festival organisers to manage the impact on the local motorway network. Highways Agency traffic officers at Knutsford will have particular responsibility for monitoring traffic conditions on the M56 around the festival but will be supplemented by an extra patrol from the Rob Lane outstation at Newton-le-Willows. Anyone found walking on the motorway network without a legitimate reason can be given an on-the-spot fine by police. Drivers can get up-to-the-minute traffic information by calling the Highways Agency Information Line (HAIL) on. 0300 123 5000 or by checking www.highways.gov.uk/traffic. Live information on incidents or congestion will also be available from dedicated feeds from Twitter with the M56 and M6 routes covered by @HAtraffic_nwest. Information on other feeds is available at www.highways.gov.uk/twitter.